A wife has one driving need—to feel loved. When that need is met, she is happy. A husband has one driving need—to feel respected. When that need is met, he is happy. When either of these needs isn’t met, things get crazy. 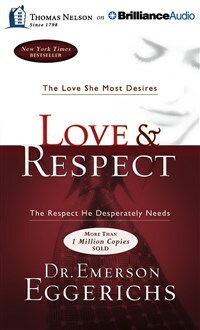 Love and Respect reveals why spouses react negatively to each other, and how they can deal with such conflict quickly, easily, and biblically. Based on over three decades of counseling, as well as scientific and biblical research, Dr. Emerson Eggerichs and his wife, Sarah, have already taken the Love and Respect message across America and are changing the way couples talk to, think about, and treat each other. What do you want for your marriage? Want some peace? Want to feel close? Want to feel valued? Want to experience marriage the way God intended? Then why not try some Love and Respect. Dr. Emerson Eggerichs, passionate about bringing biblical truth to married and family life, founded Love and Respect Ministries in 1999. Having pastored a thriving church, and earning a PhD in child and family ecology, Dr. Eggerichs now devotes himself full-time to helping marriages and families. Emerson and his wife, Sarah, have been married since 1973. - Dr. Emerson Eggerichs, passionate about bringing biblical truth to married and family life, founded Love and Respect Ministries in 1999. Having pastored a thriving church, and earning a PhD in child and family ecology, Dr. Eggerichs now devotes himself full-time to helping marriages and families. Emerson and his wife, Sarah, have been married since 1973.